Browse: Home / personal history / Happy 10th Anniversary, R.I.P.! Bob Hope was dead, and I was feeling kind of responsible. It was Monday, July 28, 2003. Word had filtered in that the 100-year-old funnyman had finally passed away just the night before, after famously outliving his New York Times obituary writer. A couple of weeks earlier, my photo-editor friend David had given me a mailing from some stock agency. It was a batch of black-and-white Hollywood pictures, classic comedians perhaps, and David knew I liked old-timey things. So this vintage image of Bob Hope was sitting face-up on my desk at work. And then all of a sudden, he was dead. I felt bad. I grabbed my scissors, clipped the photo of Hope out of the mailing, and taped it to my office window, which looked out on the cubicles. It was a little tribute of sorts. I didn’t give it another thought. Until Warren Zevon died, that is. It was a little over a month later, on September 7. Zevon had meant a hell of a lot more to me than Bob Hope ever did. And I had one of those thick-paper jewel-case wrappers from his final CD. 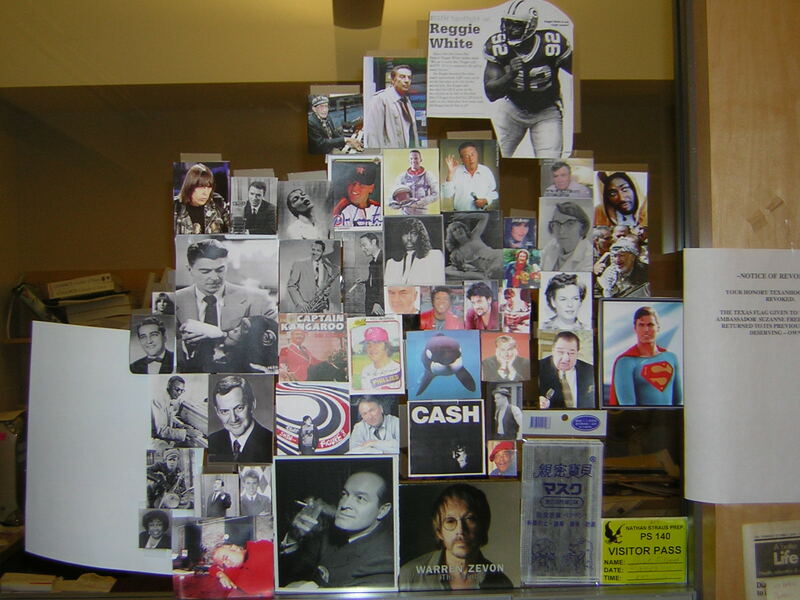 So I clipped off the front panel and taped it to next to Bob Hope. Five days later, Johnny Cash died. Now I had a “thing” going. If somebody who had made an impact on my life passed away, I’d find a photo on the Internet, print it, clip it, and tape it up. Sometimes I’d use the color printer, sometimes black-and-white. 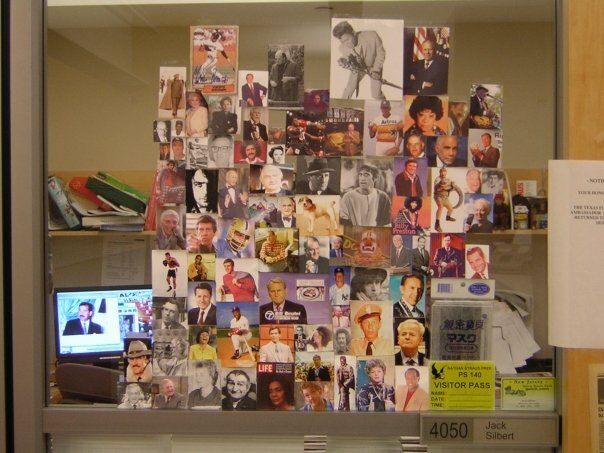 It was kind of fun, this “Wall of Death,” and besides, it kept nosy people from peeking into my office. 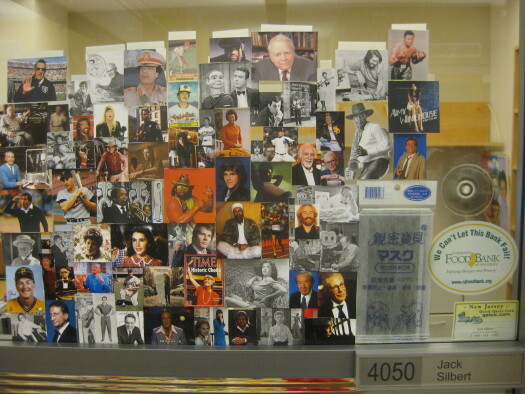 By the end of 2004, the collection had gotten pretty sizable, so I took a photo of the photos, peeled them all off the window, and re-taped them onto sheets of plain white office paper. For archiving. On January 1, 2005, former U.S. Senator Shirley Chisholm passed away, and we were off to the races once again. However, the ends of years could also be a little tricky. I usually worked till the very end of the year, but still, with weekends and holiday days, I would hope not to miss anyone “big.” In 2004, just after I took down that first group of photos, I learned that famed clarinetist Artie Shaw had passed on. I was still in the office, so I quickly printed a photo, taped it up, photographed it, and then immediately took it down again. And then Friday, December 29, 2006, was a real challenge: Would Saddam Hussein be executed over the weekend? I couldn’t miss Saddam Hussein! So before the official photo, I put Saddam up on my computer screen in the background. Some coworkers took a real interest in the Wall. “Did you put up so-and-so?” They were always impressed when I’d beaten them to the punch. Sometimes I’d be encouraged to get a photo “ready,” but to me, that seemed morbid; I didn’t want to jinx anyone. Before I knew it, I had become the R.I.P. guy. Friends counted on me to break the news of celebrity deaths; they were disappointed when there was a delay because I was at the gym or watching a movie. Colin, John, and Wayne will routinely e-mail me a heads-up of famous passings; Colin wakes up super-early so he often gets a jump on overnight death announcements. Posting R.I.P.s sometimes feels like a burden, like I have to do it. But when I take a step back, I do still enjoy it, that fleeting electronic moment of tribute. In early November of 2011, I left the job where I’d been for 19 years, and had maintained a famous-deaths window for nine of those years. It was a pretty sudden departure, and extremely emotional. 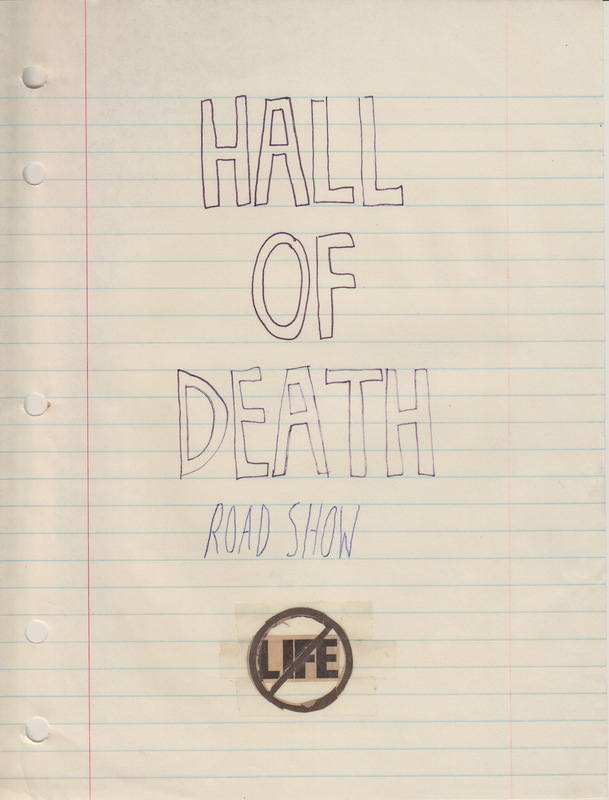 One of the things that genuinely weighed heavily on me was the five-sixths-completed Wall of Death for that year. My last day was a Friday, and I came in on both Saturday and Sunday to pack up the bizarre assortment of personal belongings that I’d accumulated over the years. On Sunday night, I repeated the ritual one final time: photograph, peel, archive. 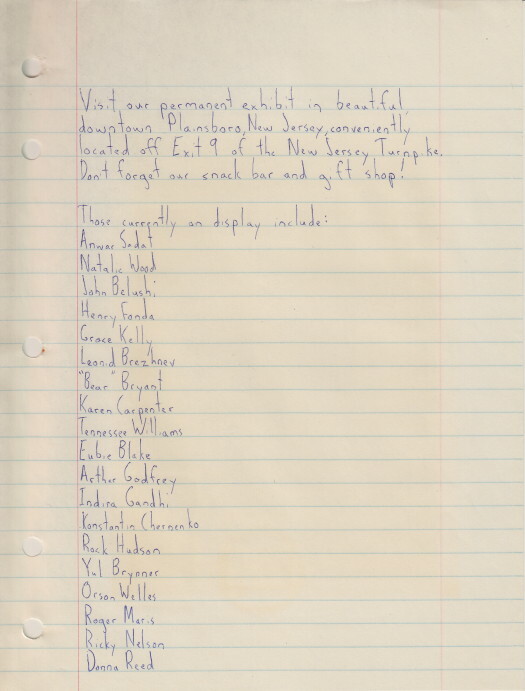 And those “permanent exhibit” names went back to at least 1981. This can’t have been a school project, but if not, what the hell was it? On the following pages are carefully Scotch-taped obituaries, one per sheet, clipped from the Trenton Times. There’s Samantha Smith, schoolgirl “peace ambassador” to the Soviet Union; Johnny Carson’s mother, Ruth; game-show announcer Johnny Olson; Dan White, who murdered Harvey Milk; Karl Pettit, inventor of the water-cooler paper cup; Bill Scott, voice of Bullwinkle; Johnny Cash’s father, Ray; Sammy Davis Jr.’s musical director, George Rhodes; Joseph Oriolo, creator of Casper the Friendly Ghost; and Olympic volleyball star Flo Hyman. Child is father of the man. You see, some things never change. They just repeat. Except the actual dead people. Because they stay dead. But your creativity is eternal. I had a laugh over that.